Would you buy a car and never get it serviced? That, in a sense, is what you're doing if you never get your racket restrung. People pay good money for their racket and they like the way it plays when new but, over time, the performance of the racket will change and this is mainly due to strings losing tension and with that their ability to perform. The strings are the engine of the racket and, if you play regularly, then the more frequently you string your racket, the better it will perform and the more consistent your game will be. In most rackets there is only one string throughout the whole racket. Over time, this string can stretch, slip at the knots or, in our weather, absorb moisture and become lifeless. In this piece, I will go through the various types of strings available, the type of player they suit, their benefits and downfalls and the tension range recommended for your frame. Generally, unless you buy an unstrung racket and specify the string type and tension, most rackets will be strung with nylon and midway in the recommended range. The recommended range is the range at which the suppliers suggest the racket will perform at its best. Each recommended range usually offers a 10lb margin eg. 50-60lbs. The higher the tension the greater the control, the lower the tension the greater the power. Different string types offer different levels of power or control. Below are the different string materials available and also the types of player they suit. 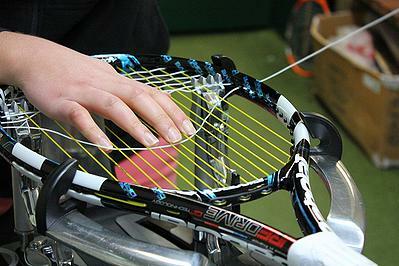 String thickness has a big bearing on how your racket will perform. String thickness or 'gauge' ranges from 15 (thickest) to 19 (thinnest). Generally, thinner strings offer greater playability and the possibility of more spin as they embed into the ball more while thicker strings offer greater durability. Nylon: This covers both nylon and synthetic gut, since in reality they are the same thing. Synthetic gut is made up of high quality nylon. A lot people use this type of string as it offers a good level of durability, as well as playability, which is what most club players want. Even in hybrids, which will be explained later, nylon is generally used as the cross strings. It is worth noting that nylon is also a monofilament string, but nowhere near as stiff as polyester. Polyester: This is the fashionable string of the moment and a lot of people ask for this string without really knowing what it is supposed to do. It is a more durable string so for the person that is regularly breaking strings it is one worth considering but know what it does before changing over to it. It doesn't move and deadens the string bed. This allows the hard hitters, to really be aggressive and still have good control. Polyester strings offer little power or comfort, so expect balls to land short of the baseline unless you increase your swing speed to compensate. Polyester string is not recommended for beginners, juniors or those suffering from tennis elbow. While it is the most durable of strings it is worth noting it also looses tension quickly. Hybrids: This is where players combine polyester with a softer string, either nylon, or for the professional feel, natural gut or multifilament. This offers the durability benefits of polyester while the softer strings reduce the stiff, dead feel from the string bed. Again, not recommended for beginners or players with, or prone to tennis elbow. Hybrids can be setup for more control or more power, depending on where you put the polyester string. Multifilament: Multifilament is the closest string type to the very expensive Natural Gut. It is a very soft string that offers lots of power and comfort. A very good string for those who suffer from tennis elbow. This string shreds as it gets worn and to club players this is perceived as a poor quality string, where in fact it is probably the nicest string to play with. Spin: This is a string with a roughness to it. It offers everything normal strings offer but with the potential for more spin as the roughness grips the ball more. As I said earlier "the higher the tension the greater the control, the lower the tension the greater the power". Control - tighter strings, means less deflection and because of this the ball deforms more, providing less return than looser strings. This means the ball won't take off when you hit it and gives you more time to direct it to where you want. Power - When you lower the tension the stringbed will deflect more and therefore the ball less, returning greater energy to the ball therefore giving more power. One of the benefits of stringing the racket at lower tension is less chance of tennis elbow. This is because lower tensions provide a softer feel and larger sweetspot, reducing the amount of shock and vibration to the arm. The down side to lower tension is that your strings will move around more. Tennis strings come in a range of thicknesses, also known as gauge, but most commonly 15 - 19. 15 being the thickest and 19 being the thinnest. The general consensus is that thicker strings offer more control and thinner strings offer more power and spin. It is also worth noting that thinner strings break more frequently. There are a lot of people stringing rackets now and unfortunately a good majority of them don't know enough about strings and tensions, which results in poor stringing jobs, injuries and unsatisified players. To ensure you are getting the best job possible your stringer should be able to go through any of the above points with you. Another thing you should ask your stringer is, how often do they calibrate their machine. To provide consistent tensions, a machine should be calibrated at least once a month but realistically every two weeks. I hope this piece helps you and if you have any questions please don't hesitate to contact me.